A 39-year-old vacuum cleaner salesman who apparently tried to grab a police officer’s gun two weeks ago, was shot and killed in a ferocious gunbattle that left a Coeur d’Alene police officer severely wounded just after midnight Tuesday. Officer Michael Kralicek, 35, was shot at close range as he chased 39-year-old Michael Madonna into a house in Hayden at 12:20 a.m. Tuesday. Police say three officers were questioning Madonna in his driveway about an earlier hit-and-run accident – and a possible petty theft – when Madonna broke away and raced inside. Kralicek and one of the deputies apparently ran after Madonna. A friend of Madonna’s said Madonna kept a loaded .357 Magnum revolver in a coffee table just inside the house. Police say Madonna grabbed a revolver, spun and shot Kralicek in the face from about six feet away before being fatally wounded by gunfire from the other two officers. Neighbors said they were awakened by the sound of gunfire. Several of the neighbors said they dived out of their beds and hit the floor, surprised by sounds in the tidy and quiet Grouse Meadows subdivision near U.S. Highway 95 and Prairie Avenue. The deputies performed CPR on both Kralicek and Madonna, sheriff’s spokesman Capt. Ben Wolfinger said. Kralicek at first was able to respond to questions by squeezing his hand, Sheriff Rocky Watson said, but then “he became unresponsive.” By 7 a.m., the officer was airlifted to Harborview Medical Center in Seattle in critical condition. Kralicek was stable after surgery at Harborview Tuesday afternoon, said Sgt. Christie Wood, information officer for the Coeur d’Alene police. Madonna was pronounced dead at Kootenai Medical Center in Coeur d’Alene. The other officers at the scene, deputies with the Kootenai County Sheriff’s Department, were not injured. They have been placed on administrative leave and, by department policy, are not being identified, Watson said. 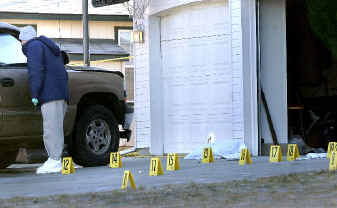 From the street, 28 evidence markers were visible going up the driveway and into the garage. At least 20 were marking the location of shell casings. “It was a gunbattle. They were fighting for their lives,” Watson said. Police have not said how many shots were fired. Madonna apparently was not someone who popped up often on police radar. But friends said the man, who had frequently seemed depressed, began acting strangely since his arrest Dec. 17 for suspicion of drunken driving and a second charge of battery for attempting to take a firearm from a police officer. According to police reports, Madonna was pulled over after witnesses say his truck was driving erratically in Coeur d’Alene on the evening of Dec. 17. After completing field sobriety tests, Madonna tried to run when city officers told him he was under arrest, the reports say. He was twice stunned by a Taser – a gun that delivers a powerful electric jolt – before he was subdued and handcuffed. An officer in a second car and an off-duty jailer passing by rushed to the officer’s assistance and Madonna was placed in shackles. Yet, Schell said, Madonna also had a pool table in his garage, a swimming pool in the back yard and would invite friends and co-workers over for barbecues or just to hang out. He was involved in pet rescue and his only statement in the written minutes of his first court appearance on the DUI and battery charges Dec. 20 was a concern to find someone to feed the three dogs at his house. Two friends of Madonna’s said the man seemed especially agitated Tuesday night. Schell said Madonna called him and said he had stolen either beer or a street sign – Schell wasn’t sure which – and then was chased by some people, slid on an icy road and banged his 1999 Chevy Silverado into one of the brick walls at the entrance to Grouse Meadows. Neighbors said Madonna’s truck was making a horrible screeching noise as it came down the street at about that time. One said she watched Madonna run into his house but not turn on any lights. A second pickup truck and a police cruiser arrived soon after, but then eventually everybody went away and Starling Street once more became quiet. A woman who was at Madonna’s house Monday evening said Madonna was agitated when he returned about 9:30 p.m. and asked her to stay and talk with him. Schell, too, said Madonna in recent days would call friends to say he loved them or to talk about how he was about to lose all his possessions. He appeared obsessed with the notion he would be spending years in prison on the assault charge because he could not afford an attorney. “He had it planned, I’m sure of it. This is a bad story of using cops to commit suicide,” Schell said. “He didn’t see a way out. He kept talking about how he was going to lose everything. “I said, ‘You’ll still have your friends.’ But that wasn’t enough, I guess,” Schell said.